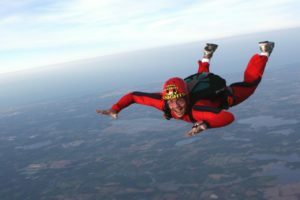 “Improv is like jumping out of a plane, and building a parachute together on the way down.” When Matt taught us that during our first class, I was already familiar with the abject terror of jumping onto the improv stage. It took several more classes to begin to comprehend the value of building the parachute together. Improv is like jumping out of a plane and building a parachute together on the way down. Photo courtesy Wikimedia Commons. No actor jumps onto the stage with a whole parachute. She contributes pieces, her ands—a character, emotion, setting, objects, ideas, conflicts—which the actors use in the construction of the parachute that will save them all. Building parachutes by committee may sound like a terrible idea, but building them alone is equally dangerous. Even the most skilled parachute builder benefits from working with a team. When others make contributions, innovations are possible. Multiple perspectives keep it interesting. Relying on others relieves the pressure of trying to do it all ourselves. Each actor in an impov scene has two responsibilities—think “yes, and…” First, anything he brings to the scene must contribute to the parachute. For example, if it has been established that the actors are spelunking, entering the scene as an astronaut is probably not helpful. As pieces are added—including the new fact that we may be suffering from oxygen deprivation—the actors work together to assemble the parachute. When done well we create a scene, tell a story, and maybe make people laugh. If we don’t work together, we crash and burn—an image that admittedly is over-the-top, but just by a little. Illustration from improv not working? How about one from a baseball movie? “Don’t try to strike everybody out. Strikeouts are boring! Besides that, they’re fascist. 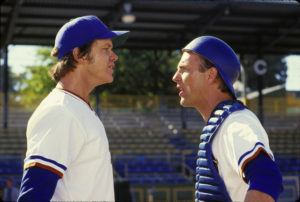 Throw some ground balls—it’s more democratic.” Image from Bull Durham. In improv, it is essential to value all the actors in the scene. Off stage, we also benefit from listening to and incorporating the contributions of others on our team. Unfortunately, the internet is training us to be expert parachute builders. We review products on Amazon and services on Yelp!. We post movie and book reviews on our blogs (sometimes without having seen the movie or read the book), and spout our “expert” political commentary on Facebook and Twitter. Those of us who are Christians, sometimes muddy the water further by adding a Bible verse to our post because no one can argue with that. Right? This proliferation of “experts” makes the internet a harsh place and contributes to the polarization of our culture. We can do better. There’s an inherent humility in improv that I am cultivating in my own life. It’s easy to be humble on the improv stage because I’m a novice (see here). In other areas it will take a little more time, but I’m committed to building better parachutes. Improv has convinced me that I can’t do that alone. Read more of my improv posts.